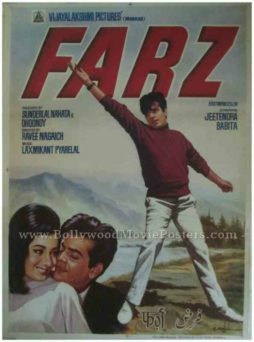 Old Indian movie poster for sale of the super hit Hindi film Farz (1967). This is an actual surviving old Indian film poster of the 1967 Hindi spy thriller that featured the “Jumping Jack of Bollywood” Jeetendra in the lead role opposite Babita. Printed and circulated during the original first release of the film in the late 1960s, this vintage Indian poster for sale was printed for publicity of the film but never ended up being used. This old Indian movie poster for sale was originally designed in hand painted oil on canvas format by one of the most talented Bollywood poster designers of all time, D.R. Bhosle. This old Indian film poster bears the printed signature of Bollywood poster painter D.R. Bhosle on the bottom right hand corner. Bollywood poster painter D.R. Bhosle’s mastery over the paint brush is clearly seen in this spectacular old Indian movie poster. A large hand painted figure of Jeetendra dancing amidst a beautiful landscape is seen prominently at the center. Highly realistic hand painted portraits of actors Jeetendra and Babita are seen at the bottom. Bollywood poster painter D.R. Bhosle’s penchant for simplicity and his focus on realism is clearly seen in this vintage Indian poster for sale. Songs from Farz, particularly “Baar Baar Din Ye Aaye – Happy Birthday To You” and “Mast Baharon Ka Main Aashiq” sung by Mohammed Rafi are fondly remembered and played till today. Hand drawn Bollywood poster for sale of the Hindi film, Laparwah (1981). This is an actual surviving original hand painted Bollywood movie poster of the 1981 Hindi film that starred Mithun Chakraborty in the lead role. Printed and circulated somewhere during the initial release run of the film (early 1980s), this Mithun Chakraborty movie poster was designed and printed for publicity of the film but never ended up being used. This old Mithun movie poster for sale was originally designed in hand painted oil on canvas format by a leading Bollywood poster design studio. A printed signature of the artist is seen on the top right hand corner of this Mithun film poster. 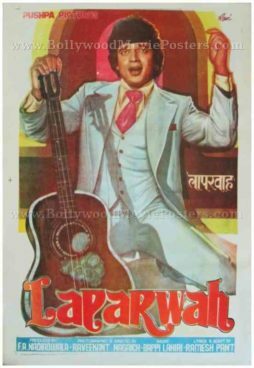 Mithun Chakraborty is seen in a brilliant hand painted rendition posing with a guitar in this hand drawn Bollywood poster. 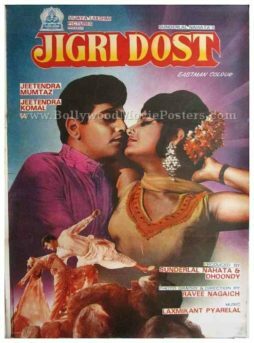 Reissue old Bollywood movie poster of the Hindi film Jigri Dost (1969) for sale. Featured here for sale is a reissue vintage Bollywood movie poster of the 1969 Hindi film that starred the “Jumping Jack of Bollywood,” Jeetendra in a dual role opposite actresses Mumtaz and Komal (Poonam Sinha). Printed and circulated several years after the first release of the film (1980s), this old Bollywood movie poster was originally designed for publicity of the film but never ended up being used. This old Indian poster features two separate photographic stills from the film – A romantic close up of Jeetendra and Komal seen in the center and a smaller still of Jeetendra and Mumtaz in a dancing pose at the bottom. As seen in this old Bollywood poster, Jeetendra is credited in the star cast twice on the left, giving away the double role plot of the film.